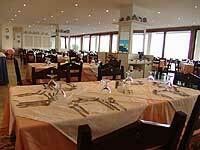 The Coral hotel is situated on the coastal line of Agios Nikolaos, overlooking the endless Blue of the Mirabello Bay. A sandy beach in front of the hotel, is giving you the opportunity to enjoy the "Blue Flag" award winning crystal clear waters of the bay. The center of the city is only 500 meters away, where you can see the unique beauty of the “bottomless lake”, or the museum, or the harbor and the coastal line, or you can simply enjoy the cosmopolitan nights of Agios Nikolaos. The hotel consists of 165 rooms, from which 120 have an astonishing view of the sea. All rooms are equipped with, double or twin beds, Color satellite TV, radio channels, direct-dial telephone, mini fridge, individual A/C units, writing desk, bathroom with bath, hair-dryer, bathroom amenities and furnished balcony. The Coral hotel is built in a two buildings attached to each other style. The first building is where the 24 hour reception is located plus the main restaurant, the main bar, the snack bar, the salt-water open-air pool and the huge sun-terrace, are to be found. The second building consists only of guest rooms that have both the sea view and pool view. The Coral Hotel is providing to its clients, all the facilities of an A class hotel, though the rates do not exceed those of a B class Superior hotel. The meeting room of the Coral Hotel, is situated on the first floor, right next to the flower patio. For larger conferences, the sister-hotel Hermes, has the capacity to host up to 300 delegates.